OSAKA, Japan--(BUSINESS WIRE)--Panasonic Corporation announced today that it has developed a drowsiness-control technology for detecting and predicting a person's level of drowsiness and allowing to stay comfortably awake. This technology, which can help prevent drowsy driving, detects a driver's shallow drowsiness1 at the initial state by accurately measuring the driver's states without physical contact, including blinking features and facial expressions, etc. captured by an in-vehicle camera, and processing these signals using artificial intelligence. Further, using measurement data from the in-vehicle environment, such as heat loss from the driver and illuminance, Panasonic’s new technology also predicts transitions in the driver's drowsiness level. The technology also combines thermal sensation monitoring function, allowing the driver to stay comfortably awake while driving. 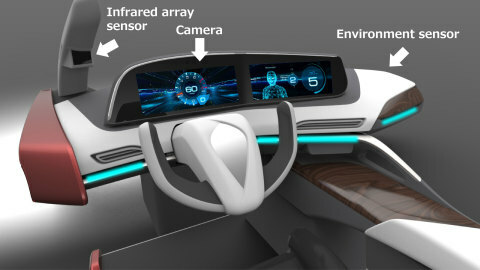 This technology has made it possible to develop a driver-monitoring system that detects the driver's current level of drowsiness and predicts transitions in the driver's drowsiness based on the in-vehicle environment, as well as a drowsiness-control system that allows the driver to stay comfortably awake. These systems prevent the driver from falling asleep while driving. Detects shallow drowsiness the driver is even unaware of by non-contact measurement of blinking features and facial expressions, etc. Collects in-vehicle environment data to predict transitions in the driver's drowsiness level. Senses and monitors the driver's level of thermal sensation, allowing the person to stay comfortably awake. Conventional drowsiness-detection systems had difficulty in predicting transitions in drowsiness. Conventional anti-hypnotic stimulant systems use alarm sounds and vibrations to wake up users, which can make them feel uncomfortable. Panasonic's newly developed technology, with 22 patents on file, is suitable for applications in human- and environment-monitoring systems for use in such places as private and commercial vehicles, offices and educational institutions; drowsiness-prediction systems; and drowsiness-control systems for keeping people awake. 1. Detects shallow drowsiness the driver is even unaware of by non-contact measurement of blinking features and facial expressions, etc. A person who feels drowsy shows various signs. For example, people will "have a drowsy facial expression," or "blink in a specific way," when becoming drowsy. Identifying these signs allows to detect the level of drowsiness. Utilizing image recognition technologies refined through the development of monitoring cameras and other systems, Panasonic has recently developed non-contact and highly accurate technology for detecting people's blinking features and facial expressions, etc. from photographed images. The company has also compiled a database of various measurements on drowsiness and biological signals, and analyzed, from a physiological standpoint, the relationship between about 1,800 parameters related to blinking features and facial expressions, etc., and drowsiness that were extracted from the database. Based on the results of an analysis of drowsy expressions compiled during joint research with the Ohara Memorial Institute for Science of Labour, a public interest foundation, Panasonic has developed an artificial intelligence capable of estimating an individual's drowsiness level. These achievements allow to detect the signs of shallow drowsiness, even if a person is not aware of it, and to identify the actual level of drowsiness. Generally, people rarely become drowsy in a cool and bright environment, but can easily become drowsy in a warm and dim environment. Therefore, it is assumed that drowsiness depends on in-vehicle environmental factors, such as temperature and brightness. However, some people wear a lot of clothes while others wear less at the same temperature. Such variations in human behavior make it difficult to estimate people's drowsiness based only on the ambient temperature. 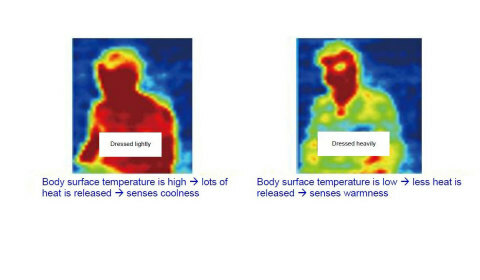 Panasonic has conducted joint research with Chiba University, which revealed that heat loss from a person's body is correlated with the person's drowsiness after prescribed time elapses, regardless of how much clothes the person wears. Panasonic has also developed a contactless technology to measure heat loss from a person's body with the company’s original infrared array sensor Grid-EYE . In addition, the company has identified the effect of the elapsed time and the surrounding brightness, which is measured by an environment sensor, on a person's level of drowsiness. These results have made it possible to predict how a person's current drowsiness can change by means of heat loss from the body (measured without contact) and the surrounding brightness. Adjusting room temperature or airflow based on an individual's estimated level of drowsiness makes it easier to keep a person awake. However, a person would feel a cold when the room temperature is too low, which the level of thermal comfort would be disturbed. By applying our knowledge of thermal environments and physiology accumulated through research & development of indoor air conditioners and other products, Panasonic has developed, through joint research with Nara Women's University, a technology to estimate the thermal sensation2. This technology can be used inside a vehicle, where the effects of airflow and others are significant. By applying the infrared array sensor Grid-EYE, an individual's level of thermal sensation can be constantly monitored as an optimum means of controlling temperature, for example, an air conditioner. This allows a person to stay comfortably awake3. 2 Technology using an infrared array sensor to detect a person's level of thermal sensation (sensing of warm and cold) without contact. 3 When a driver's current drowsiness level is detected as high, a sound alarm or a command to rest is issued. Scale for determining the level of a person's drowsiness from the facial expression. The drowsiness levels are assessed into following five levels: 1. Not drowsy at all, 2. Slightly drowsy, 3. Drowsy, 4. Very drowsy, 5. Seriously drowsy. Source: Hiroki Kitajima, Nakaho Numata, Keiichi Yamamoto, Yoshihiro Goi: "Prediction of Automobile Driver sleepiness (1st Report, Rating of Sleepiness Based on Facial Expression and Examination of Effective Predictor Indexes of Sleepiness)," Transactions of the Japan Society of Mechanical Engineers (C edition), Vol. 63, No. 613, pp. 93–100, 1997. The infrared array sensor carries two-dimensionally arranged pixels that detect infrared rays (wavelength: 10 µm) emitted from a human body or object. It is capable of measuring a two-dimensional temperature distribution. Panasonic’s infrared array sensor Grid-EYE has 64 pixels. Equipped with a super-resolution algorithm and can be swung with appropriate speed and an angle, thus offering clear thermal images equivalent in resolution to images created with about 7,800 pixels.